Guides the mandolin student through all the basic mandolin chords and some advanced chords also. Chords are shown in all keys. Featured chords include: major 7, minor 7, 6, minor 6, 9, diminished, augmented and many more. Each chapter presents a chord by type. DVD format makes navigating easy. Download now from PlayBetterBluegrass.com! 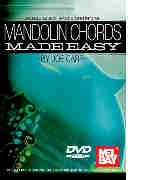 This DVD is loaded with easy to understand basics for learning to play the mandolin. This DVD will help you play the songs you love to hear on the mandolin. Taught by the multi-talented George Goode. This DVD presents melodies, lyrics and chord symbols for several songs. Tuning and hand positions are briefly discussed. You will be comfortable playing 4/4, 3/4 and 2/4 rhythm chord accompaniments in three major keys - C, G, and D. Download now from PlayBetterBluegrass.com!